When an email arrived inviting me on a “hunting trip to Nassau”, I looked out of the window to a dreary winter sky, full of coldness and imagined myself spending three days on a sun drenched Bahamian beach, idly flicking a lure across the tropical waters. I replied in the affirmative, only adding, “What are we hunting?” as an afterthought. The answer “wild boar” was rather surprising. Apparently not only is Nassau a hot spot in the Caribbean, but also the name of a town renowned for boar hunting in the Rhineland. 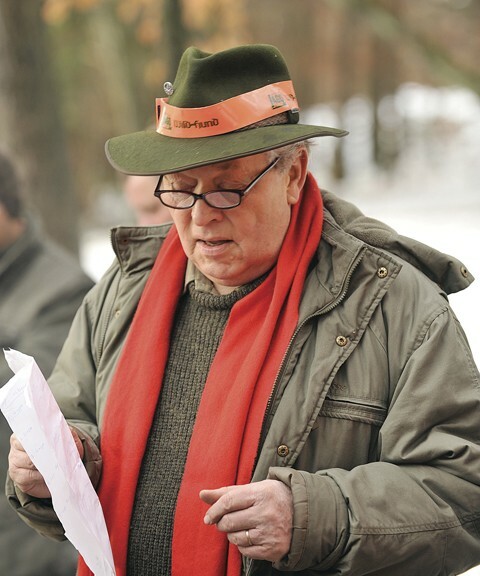 The “Pachter” of the Nassau shoot, Joachim Stamp. Undeterred, I arrived in Nassau and was greeted by my guide for the weekend, Guido Augustin, and shoot organiser Joachim Stamp – along with 18 inches of crisp snow. The boar shooting area is rented by Joachim, known officially as the “Pachter”, on a tenancy system which is similar to having shooting rights. 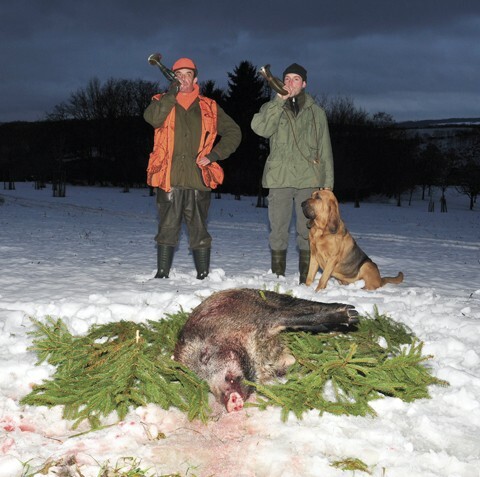 He is responsible for ensuring there is minimum damage by the boar on his area (vast tracts of forest and arable land) by culling as many as he can. Failure to do so means paying out compensation to the farmers for crop damage. The boar shoot in Nassau is a club for the people of the town, and they are unique in that they are the only driven hunt in Germany who use bloodhounds to search for and drive the boar to the standing guns. Despite the local feel to the day’s sport there were several overseas visitors, including Endre Killian and Hegedus Garbor, who had travelled all the way from Hungary just to help with the beating and watch the hounds work. The renowned Namibian game ranch owner, author, TV presenter and African wildlife expert Immo Vogel had also travelled from his homeland to shoot with old friends. Due to the considerable distance the boar are pushed there are only two drives in the day: one before and one after lunch. As the snow started to fall the team of guns took their places in the forest. I opted to go with the hounds on the first drive, and it was interesting to see as many women taking part as men. Hounds and beaters alike watch for boar with bated breath. The hounds were led to the cover, a steep mountainous hillside littered with old vineyards overgrown with brambles and hawthorns and seemingly impenetrable to anything other than a wild pig. When loosed they started casting up and down the hillside until one of them came across a fresh boar scent and exploded into a deep song. With the guns over a mile away at the end of the drive, they could easily hear the hounds pushing a boar towards them thanks to the blood curdling noise they made, echoing up the valley and through the forest. I had to agree with him; it certainly raised the hairs on the back of my neck and brought a lump to the throat to hear their eerie music streaming out. After the longest, hardest drive I have ever taken part in we discovered that although half a dozen boar had been driven to the six guns, only one had been shot and killed, with another possibly injured. 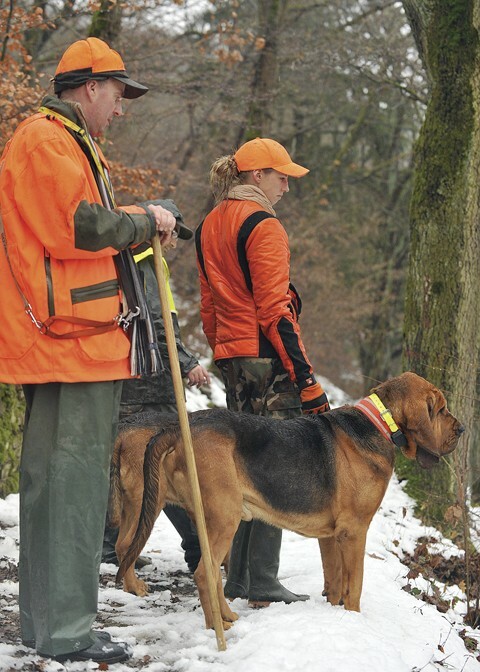 One of Heiner’s hounds had also gone missing, so over an hour was spent studying the tracker receiver and driving about the forest until he was safely recovered. These hounds and their owner are held in high regard, and many beaters gave up their lunch to help in the search for the missing Oswald. 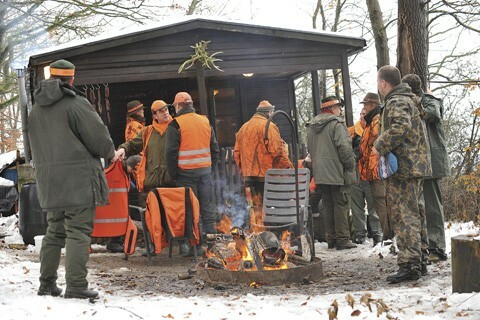 Lunch was held between drives, the guns and beaters heading back to a traditional hunting cabin in the forest where a very organised team of ladies had hot soup, wild boar sausages and bread rolls at the ready for us. As one would have expected, all this was washed down with a good local beer. The cabin had stood in the same spot for almost 200 years, catering for generations of hunters. The quaint hunting lodge was a wooden building, belonging to the town of Nassau. Looking very much like the cottage from Hansel & Gretel, it had stood in this secretive clearing overlooking the town with its gothic castle and snow-capped hills for over four decades. Each generation of hunters had added a little bit more character to it in the form of handmade furniture, boar paintings and trinkets. A woodburning stove inside kept the dining area warm, and outside three large braziers held fires that warmed hands, snow-soaked trousers and gloves alike, everyone jostling to get nearer the warmth for a few more minutes before leaving for the next strenuous drive. The afternoon’s hunt was in the forest immediately surrounding the cabin, and guns were placed at about 50 yard intervals amongst the pine trees. Each gun had been put next to a tree carefully selected as a good vantage point and clearly marked with tape to show them exactly where to stand. The surrounding trunks bore red paint marks to indicate where boar shooting would be dangerous to the neighbouring gun. I accompanied a local German hunter, Wilfred Augustin, and when he told me where I could stand it was made quite clear that I was not to move an inch either direction, no matter what happened. Somewhat worryingly he then positioned himself a few feet behind me. 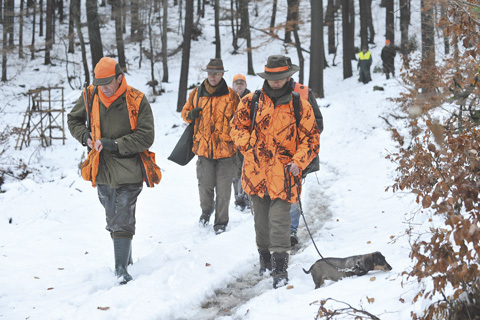 Boar hunting is a dangerous sport, and all involved must wear high visibility clothing. I later discovered this was because he planned to shoot the boar after it had run through the gun line. As I didn’t know that at the time I stood like a statue for two hours in the snow, expecting to feel lead whistling past my ear at any moment. Away in the distance the hounds could be heard once again, pushing forward and rousing several roe and fallow deer in their wake. A surprised fallow buck found himself just a few yards away from me as he fled from the sound of the approaching bloodhounds, turning to disappear down the hillside and into the snowy shadows just as Wilfred lifted his gun. Even the diminutive teckels, stood at the hunter’s feet and traditionally renowned for their gameness, looked slightly concerned as the hounds drew closer. This time the boar were clever. Instead of pushing forward to the awaiting guns they ran backwards through the beaters, making it unsafe to shoot them. They made good their escape into the depths of the 3,000 acre forest. It seemed that the severe and early cold snap had sent many of the pigs deep into the forest, and so only a single boar was shot on the day. An after-search was made for the injured pig that had been shot at in the morning with a specially trained bloodhound called Paula. The search that took place was on a par with a forensic operation. As I watched her handler on his hands and knees, he explained to me he was searching for minute bristle particles in the snow that would tell him which part of the pig had been hit. However, it was eventually concluded that it was a minor flesh wound, and that the pig could easily have travelled a further 20 kilometres in the time after the first drive, and clearly wasn’t too injured. As darkness fell we all went back to the hunting lodge, where the traditional post-hunting celebrations began. This started with the single boar being surrounded in pine branches, and the successful hunter, in this case Tanja, the daughter of the Pachter, being presented with a sprig of pine to wear in her cap. The horn blowing, to pay tribute to the hunted boar, followed, and much to everyone’s amusement Paula the bloodhound threw back her head and joined in with her own version of the rousing music. The shot boar are honoured at the end of the day in the European tradition, with horns and local spices. Afterwards the boar was loaded onto a quadbike and taken to the town coldstore for veterinary inspection before being butchered and shared out amongst the team of guns. As the wind blew and the snow fell the hospitality alone was enough to keep us warm, with schnapps and hot apple strudels thrust into our hands until late into the night, and hunting and boar shooting tales swapped around the campfire all evening. So it was with great sadness that the following morning we awoke to the news that overnight the cabin had been engulfed in flames left over from a brazier and burnt to the ground. We walked back up the hillside to find its charred and smouldering remains, completely destroyed, and decades of memories all blackened in the snow. It was a sad end to a fantastic day’s boar shooting, but hopefully there will be a new cabin there when we return.